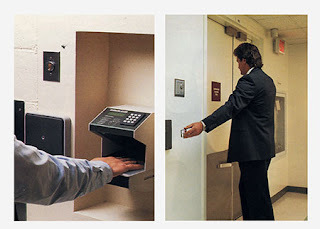 Access control means that, when your facility is open, no visitor, delivery service person or unknown individual is able to enter your facility without being both observed (directly or indirectly) and approved. Several techniques to accomplish that goal may include any or all of the following. A security desk should be set up in the main lobby of each building which has an open-access or open-door policy. A sign-in/-out log, supervised by an employee who validates identification prior to allowing visitors to proceed into the building, is highly advisable. Ideally, an institution should have a single entrance only, monitored by a staff person and equipped with an intercom system for communicating with anyone who comes to the door. Simply, an open door policy does not mean that every door need be left open and unlocked. identity or legitimacy, it will be difficult to identify a potential intruder. It is worth a few moments to contact the person’s company or organization to determine the legitimacy. At no time should visitors be allowed to roam freely through your property unsorted or without being observed. That is especially true for individuals who expect to work on your most sensitive systems such as burglar alarms, fire alarms,communication systems or computers. Special diligence should be applied to those individuals when they visit your institution even if they are legitimate. For larger institutions, certain areas should be considered off-limits to all but authorized personnel. End-of-day locking procedures should include a visual examination of all areas to prevent “stay-behind” intruders. All employees should have and wear identification. Such badges make identification of non-employees immediate. Moreover, such cards will not only enable visitors to immediately identify those who work in an institution but will psychologically help employees understand that they are part of their agency’s security team. Photo identification should only be provided with accompanying education regarding their care, the procedure to be followed if they are lost, as well as the manner in which employees should approach unknown individuals. Creating ID badges requires thought. Cards should have clear pictures along with the employee’s name. The institution’s name should not necessarily be placed on the card. In any event, employees should be instructed that their card should be prominently worn while in the building and, for their own safety, kept from view when away from the building. There is no reason why a person in the street or in a train should be able to identify who you are and where you work. Lost cards should be reported immediately.